Gran Vals by Francisco Tárrega (1852–1909) for Classical Guitar. This is one of the most popular works in the guitar repertoire. The level is early advanced (Grade 8-9). The notation PDF is free and you can also purchase the TAB. This is also known to some as the Nokia tune as it is based on Gran Vals (also called Grande Valse or Grand Waltz). Join my Email Newsletter or help support the site & free music. 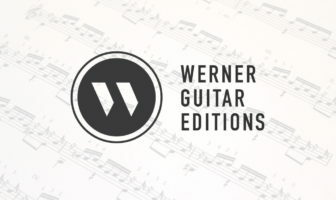 Buy Gran Vals TAB from Werner Guitar Editions – my dedicated store for free and premium guitar music. Instant access to PDFs, the best security, search functionality, and payment options. Norwegian guitarist Christina Sandsengen plays Gran Vals by Spanish composer Francisco Tárrega (1852–1909). This comes via her YouTube Channel. George Sakellariou playing Tarrega’s Gran Vals via GSI on YouTube. Anika Hutschreuther plays Gran Vals via her YouTube.